When the Betts estate in South Road was subdivided to form two new streets in 1960 it was only natural that one of the streets should be named after the owner, prominent local body politician and businessman, John Alick Betts. Betts developed a successful meat exporting company, and served a number of terms on the Masterton Borough Council. He was the founding chairman of the Masterton Licensing Trust, and was active in a number of sporting organisations. He was President of the Masterton Racing Club, and a very successful racehorse owner. He died in November 1959. Betts Avenue and Madden Place were formed out of the land behind his home. J.A. Betts’ son Tony, who honoured one of his father’s long term employees when he named Madden Place, carried out the subdivision. Bob Madden worked as a drover in Wairarapa for 30 years, having previously been a farm manager, and running his own property. He worked as a drover until he was 88. Pic: J.A. 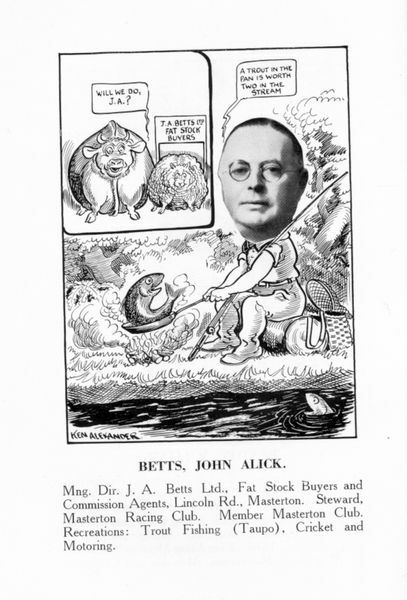 Betts, meat wholesaler and land developer, from a cartoon in the 1940s.